Each quarter we present a selection of high quality papers from the latest JARMAC issue. 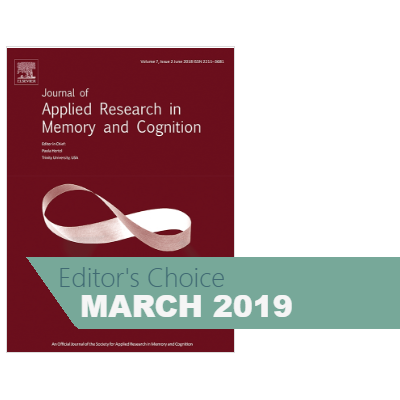 These articles are nominated by the journal’s editors and are considered to be of interest to everyone with a broad interest in applied memory and cognition. Please click on the article titles within each post to be directed to the full article. Questions regarding the research can be addressed to the corresponding author. For all other questions, please contact Stefanie Sharman at stefanie.sharman@deakin.edu.au. All articles are free to access for 3 months within publication. Policymakers have drawn implications for K-12 education on the predicted impact of the Internet on memory and cognition. In this article, three such implications are described, which are based on a misunderstanding of the cognitive processes involved. The first implication is that there will be a reduced emphasis on memorization in schooling, as it is easier for students to quickly access information on the Internet than to retain it in memory. The second implication is that the “flipped classroom” method of teaching, which depends on the Internet as students are meant to learn new content at home through video lectures and readings before attending class, should be successful. The third implication is that personalized learning, with computer-based individualized instruction for each student, should be possible with the Internet. To date, however, the research has shown that none of these three ways of utilizing the Internet in schooling has lived up to its promise. Student learning is a complex system, and predicting the consequences of change to one part of that system is at best uncertain. Internet usage may affect many aspects of cognition, as people increasingly rely on the internet to seek, post, and share information. We identify ten properties of the internet that we know influence cognition, based on decades of cognitive science research as well as work examining other ways that people externalize memory and cognition (such as printing out information rather than trying to remember it). These properties can be roughly organized around (a) internet content (e.g., the sheer amount of information available, the frequency with which it changes); (b) internet usage (e.g., access is easy, returns results almost instantaneously); and (c) the community involved in the creation and propagation of content (e.g., anyone can participate, although authorship may often be obscured; the internet connects people in an unprecedented fashion). We then consider whether the internet encourages superficial processing of information, is a powerful source of misinformation, inflates people’s beliefs about what they believe they know, and changes how people remember their personal lives, among other questions. Are jurors more likely to convict a suspect who has been identified by multiple eyewitnesses than by a single eyewitness? We hypothesized that the persuasiveness of multiple versus single eyewitnesses depends on how they justify their identification of a suspect. Participants saw a typical lineup of similar looking individuals with one person highlighted as having been identified as the suspect by either one or two highly confident eyewitnesses. Participants estimated the likely guilt of the suspect after reading the eyewitnesses’ statements of confidence about their identification (e.g., “I’m positive that it’s him”). Two eyewitnesses were only more persuasive than one when eyewitnesses provided either a confidence statement only or a confidence statement and a recognition justification (e.g., “I recognize him”), and not when they referred to a visible facial feature. The results are consistent with our perceived diagnosticity account, which explains why eyewitnesses are regarded by others as more accurate and more persuasive when they justify an identification by referring to an unobservable feature.